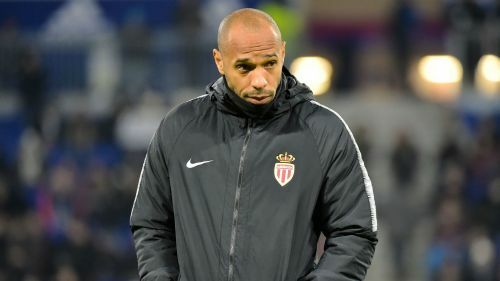 Thierry Henry departs Monaco with "great sadness" but is confident they have the squad of players to remain in Ligue 1 under Leonardo Jardim's stewardship. Henry was suspended on Thursday and his sacking was confirmed 24 hours later, the club's former striker leaving after just three months in charge having replaced Jardim and failed to inspire a turnaround to move them away from the relegation zone. Franck Passi will take charge for the relegation six-pointer against Dijon on Saturday before Jardim reassumes control. Henry's departure comes with the club a point and a place above the bottom of the Ligue 1 table, with the former Belgium assistant having overseen a Champions League group-stage exit and a Coupe de France humbling at the hands of second-tier Metz during his brief spell. That defeat proved the final straw, having come on the back of a 5-1 thrashing at the hands of Strasbourg in which Henry was involved in a foul-mouthed confrontation with their defender Kenny Lala, for which he later apologised. Henry averaged 1.22 fewer points per game than Jardim did in a tenure that saw him guide Monaco to the Ligue 1 title in 2016-17, and the Principality club are banking on the Portuguese being able to rediscover that magic. However, Henry seemingly leaves on good terms, posting a statement on Twitter that read: "It is with great sadness that I part company with AS Monaco. "My ambition and philosophy from the day I joined will always be that the CLUB comes first. I strongly believe in this squad of players and that the team with all the recent new signings is now in a better shape to tackle the second part of the season and to go on a winning run and fulfil its potential. "I would particularly like to thank Vadim Vasilyev and Michael Emenalo who afforded me this opportunity at my boyhood club and of course the fans and staff who have given me such a warm reception during my tenure. "I sincerely hope that my successor will now take AS Monaco onto greater strengths and I wish them all the success for the future starting with a win in Dijon and then lifting the cup [Coupe de la Ligue] and getting us back into Europe."